Artists Basel Abbas and Ruanne Abou-Rahme will hold a listening party on campus to talk about the importance of sound in their work, including an exhibition currently at Krannert Art Museum. CHAMPAIGN, Ill. — Sound is essential to the work of artists Basel Abbas and Ruanne Abou-Rahme, who use both audio sampling and their own compositions to create the soundtrack for their installations and performance pieces. The New York-based Palestinian artists will be on campus for a three-day residency April 4-6, during which they’ll discuss their work “And yet my mask is powerful,” currently on view at Krannert Art Museum, 500 E. Peabody Drive, Champaign. The artists will discuss the two-part exhibition using sound, video and installation at an artist talk at 5:30 p.m. Thursday at the museum. They’ll host a listening party at 5 p.m. Friday at Channing-Murray Foundation, 1209 W. Oregon St., Urbana, during which they’ll play some of the sounds and music they’ve used and talk about the importance of sound in emphasizing certain themes in their work. For Abbas and Abou-Rahme, sound is not an afterthought that is added to visual images, but is often the first element of a new work. “I’m really intrigued by their attention to soundscapes,” said Maryam Kashani, a University of Illinois professor of Asian American studies and gender and women’s studies. Kashani, an anthropologist, filmmaker and DJ with an interest in sound and music, will moderate the conversation at the listening party. “(Their approach to) how sound influences how the rest of the piece emerges is unique among artists and unique in audiovisual work. In film and video, sound is often added to the image,” she said. Basel Abbas and Ruanne Abou-Rahme will talk with students about the issues of colonial legacies and cultural heritage raised by their work, during a three-day residency at the U. of I. 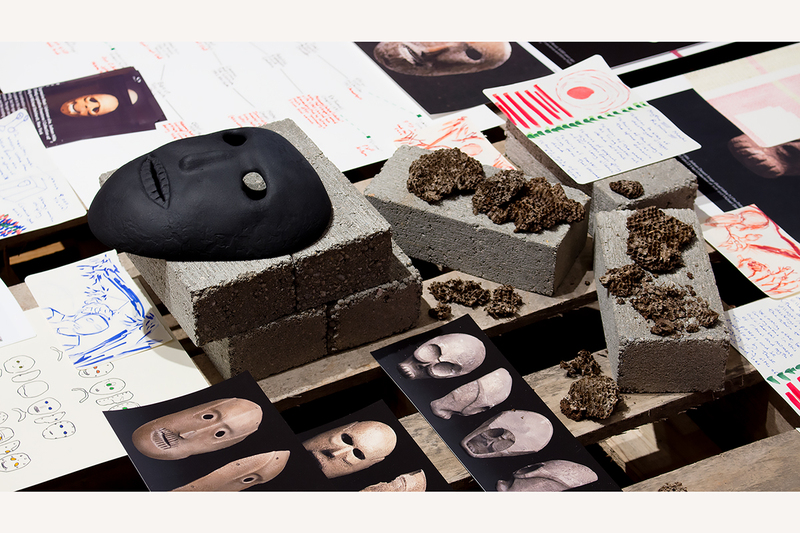 “And yet my mask is powerful” considers cultural heritage and new narratives from the Middle East in order to offer something beyond a sense of endless crisis and violence. The artists used text from the poem “Diving Into the Wreck” by Adrienne Rich to think about what can be salvaged from disaster. The sounds used in the installation partly reinforce ideas from the poem, including being submerged in water, said Amy L. Powell, the curator of the exhibition and Krannert Art Museum’s curator of modern and contemporary art. 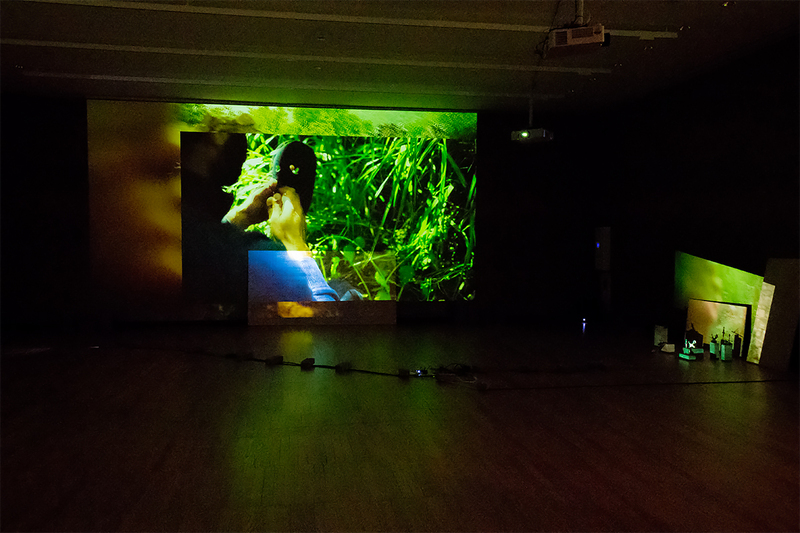 “The work begins with these gentle sounds from nature – plants rustling in the wind, then the sound of water, but abstracted, in multiple layers. It has a rhythm to it and a repetition that orients you into the images you’re seeing of young people exploring what remains of Palestinian villages in Israel,” Powell said. The exhibition also raises questions about colonial legacies, cultural heritage and how cultural artifacts circulate. Several professors have visited the exhibition with their classes, including Kashani. She is teaching a course on theories and theologies of liberation in the context of decolonialism, feminism and religion. Abbas and Abou-Rahme will visit the seminar class and talk with students during their residency. “They will offer an expansive view to students in terms of other modes and practices of thinking about the issues we cover in our class. It can be challenging for students to think and express ideas in other ways,” Kashani said. “To have students have direct interaction with Basel and Ruanne, not just as artists but as researchers, and see the production of their work as a form of research and a way of asking questions about very fraught issues, is really great for students along with all of the museum’s audiences,” Powell said. The exchange will also benefit the artists, whose connections with faculty members at the U. of I. will help them with ongoing projects, Powell said. 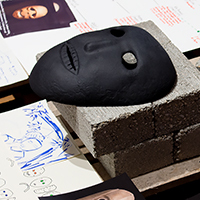 Editor’s notes: More information on the exhibition and related events can be found at https://kam.illinois.edu/exhibition/basel-abbas-and-ruanne-abou-rahme-and-yet-my-mask-powerful, or by contacting Julia Nucci Kelly at jkell@illinois.edu.